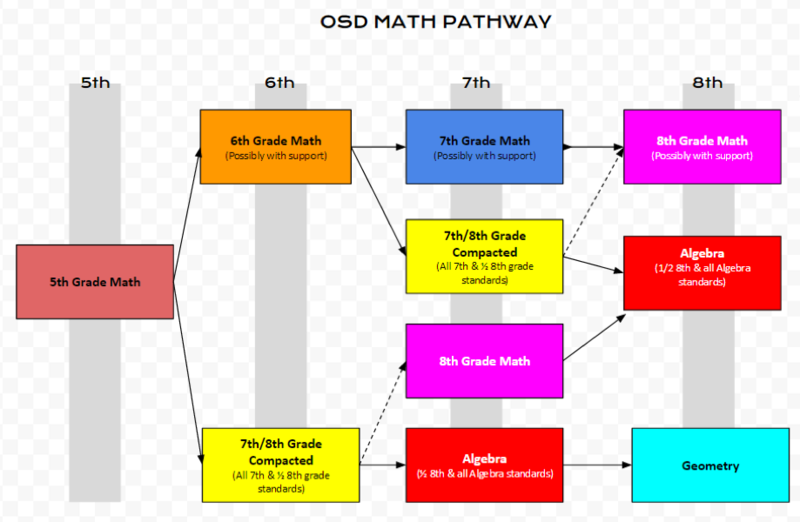 The Olympia School District aims for all students to be successful in math. Our goal is that each child is placed in the math course that is most appropriate for their learning needs as they move through their middle school and high school years. The rigorous Washington State Standards for Mathematics (Common Core State Standards) require students to begin learning Algebra in much earlier grade levels. Many of the topics that used to be taught in a high school Algebra 1 or Geometry course are now being taught in 6th, 7th, and 8th grades. The effect of this is that all students are being accelerated in their mathematics learning through middle school. Recognizing that some students are able to learn more quickly, and that the progression of learning through each grade level is dependent on students having the opportunity to learn and master the standards from previous grades, the Olympia School District has modified courses and placement guidelines for middle school students in the Olympia School District. Students who demonstrate readiness for early advancement in mathematics may be eligible for placement into an Accelerated Mathematics Pathway. Indicators of readiness include a high level of conceptual understanding, procedural skill and application of mathematics. A willingness to engage in problem solving, reasoning, communication, and connections, will also be indicators for students who are ready for early advancement. If you have any additional questions please feel free to contact the Olympia School District Teaching and Learning Department at (360) 596-8545.